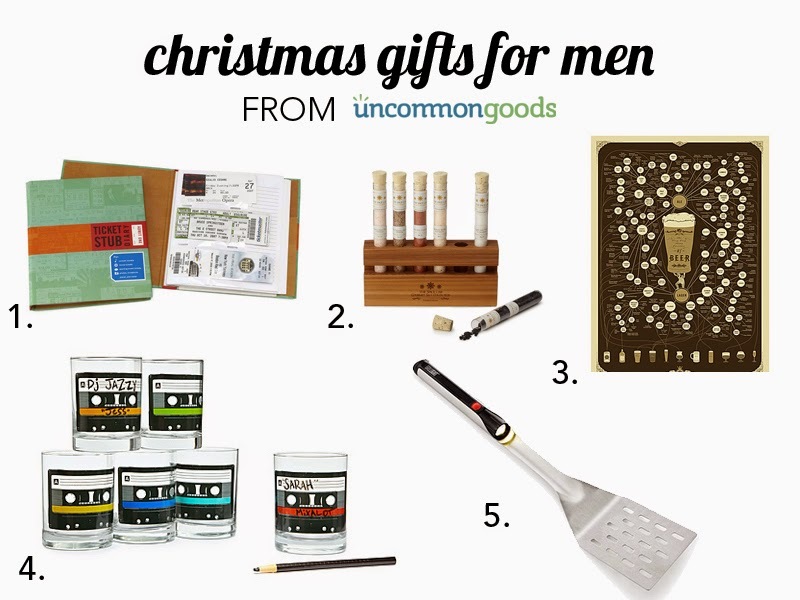 I'm usually not one for gift guides, but 'tis the season and Uncommon Goods has a ton of great options for gifts! I love Uncommon Goods because they have some really great, unique products, all direct from the artists—half of all of their products are made by hand, which is amazing. They even feature Studio Tours where you can get a peek inside the workspace of the artist who made the product. One of my favorite things that they feature are their Design Challenges, where you can participate with the community and create new products and designs. Christmas is exactly one week away (!) so if you haven't bought gifts for everyone on your list, here are some great last minute ideas! A great gift for anyone who loves going to concerts or plays! Perfect for your favorite cook or foodie. I definitely know some dudes who would love to have this framed & on their wall! These are perfect for parties since you can write on them! This is genius for late night grilling (I'll take one please!). I love terrariums, and these necklaces are just gorgeous! A beautifully carved jewelry holder, perfect for any jewelry loving lady. So delicate & elegant—great for anyone who loves dangly earrings. Simply gorgeous and a perfect gift for the hostess. For the tea lover—I know so many people who would love this! Guys, it's a bubble wrap calendar! So awesome. This is perfect for anyone who loves keeping fresh flowers around the house. Retro awesomeness—another great host gift! For your favorite coffee snob: a set of four single origin coffees from around the world. 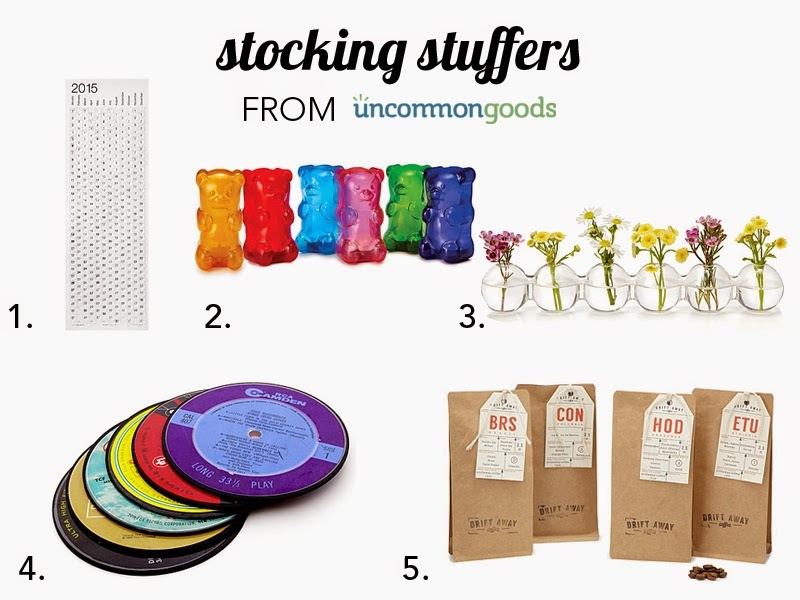 Check out more great stocking stuffers here! 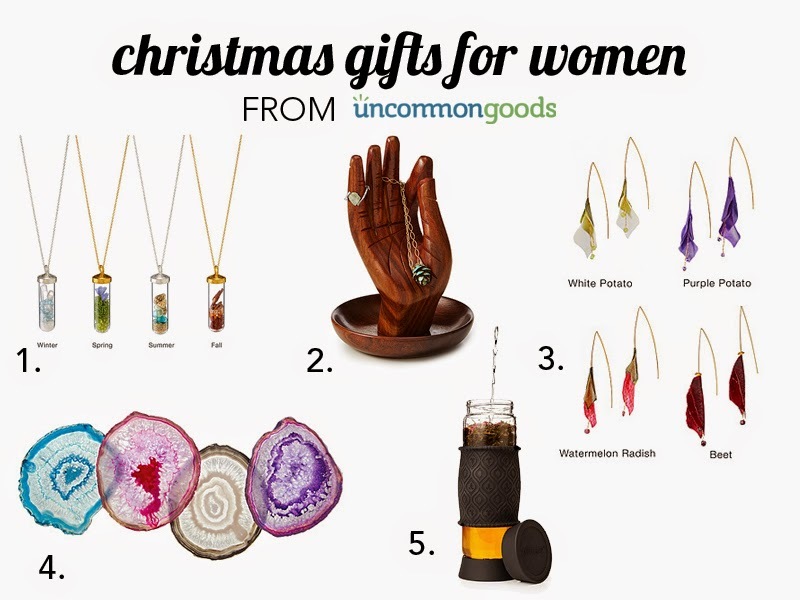 If you're in need of last minute Christmas gifts, ideas for next year, or birthday gifts, definitely check out everything Uncommon Goods has to offer—they have an amazing selection of handmade and thoughtful gifts for everyone. Thank you to Uncommon Goods for sponsoring this post. All opinions are my own. No affiliate links are contained within this post.